It’s been a busy week for the the crew. We have conquered Skull Island and defeated our on going nemesis Fin Dorsal. Actually we have defeated him several times now. He’s such a character. I can’t help but like him. He’s so full of hot air and bravado as he tries to be menacing. We’ve met a lot of new people and for a pirate crew we do seem to be extraordinarily helpful. Who ever heard of a honest pirate? But our reputation is getting around the spiral as one of the best Captains and crew to have around; or at least to have on your side. We have recovered stolen statues, lost trinkets, stolen rings, hidden treasure and lost kids all over the Skull World. We did a few favors for some poisoned pirates, put some other pirate ghosts to rest and defeated some really big sharks, walking zombies and Cut Throat, Monquista and Rapa Nui pirate ships! We have sailed to Blood Shoals, Jonah Town, Rapa Nui, The Presidio, Flotsam and the Ruined Light House. We found Captain Gunn’s old vacation home and his lost tomb! And we met a strange little Jack rabbit named One-Eyed Jack. It’s been a very busy week indeed! 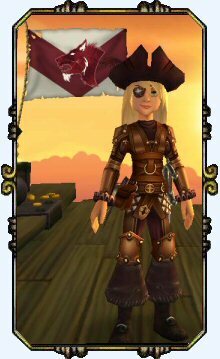 The Captain has become a captain and a level 10 pirate! The crew has grown immensely as well. My loyal friend and first mate Subodai has been joined by our first new member, a Cat Pirate named Wild Jim O’Leary. We picked up a Mouse Fencer named Sarah Steel and a childhood family friend the Dog Pirate Lucky Jack Russel. It was good seeing him again and I’m glad he joined our crew. He has been very helpful indeed. 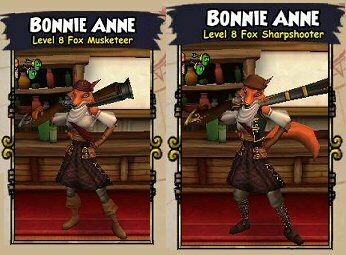 One of our first ship mates, the musketeer of the group, Bonnie Anne has her own big news to celebrate too. She has graduated from a Fox Musketeer to a Fox Sharpshooter with a brand new shiny gun. And my goodness does she know how to use it! Oh and we’ve picked up a new strange crew member, at the protest of Sarah Steel. A witchdoctor from Shady Hollow named Old Scratch of all things. He’s an odd little fellow who rattles about during the night and keeps everyone awake. But he has some special magic skills that have really come in handy. The most exciting news however was meeting up with the Frogfather in the Gullet at Jonah Town after we rescued Jack Russel. We discovered that my parents had docked their ship there in Jonah Town many years ago and paid the Frogfather docking fees to keep it there. Amazing that after all this time, someone like the Frogfather would have held onto the ship and so freely handed it over without further compensation. But we’re not about to turn him down. My parents had named the Light Skiff “The Golden Falcon”. It was a great name, but it really doesn’t suit this Captain and her new crew. While the ship was in dry dock, we made a few improvements and had the ship painted in my custom color of crimson (dark red). 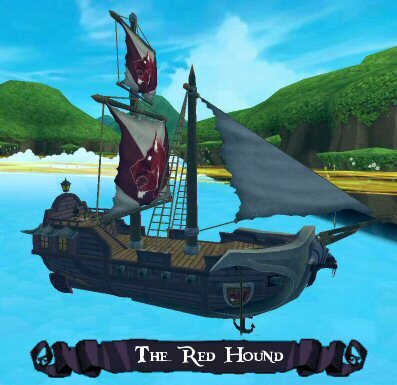 We also had a new name registered for my first real boat as well; The Red Hound! Well it’s been a nice rest, but it’s time to get back to the skyway. 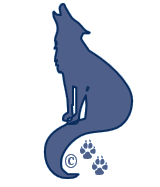 This ends the first Captain’s Log Of the Red Hound! ← We Introduce Our Permanent Characters!